Interesting. This week, Time's cover story is an essay arguing in favor of teaching the Bible in schools, which can be boiled down to this: "Of course the Bible should be taught in schools. Duh. It's religion that shouldn't be." On the cover of its international edition is a story that is less easily boiled down: "The Truth About Talibanistan," about the resurgence of the Taliban and al-Qaeda in Afghanistan (and also, Pakistan), and how it's "the next battleground of the war on terrorism." The story is in the U.S. edition of the magazine but not on the American cover, presumably because Rick Stengel & co. think the Bible will do better newsstand (even though it is a singularly unattractive cover). and how it's a place from which "Al Qaeda or other terrorist groups [can] hatch the next 9/11." The American cover? An exclusive cover shot and story on Annie Leibovitz entitled "My Life In Pictures" (which was also controversial for whitewashing her life as a lesbian); presumably Jon Meacham & co. thought it would do better on the newsstand. It's odd that Time would choose to backburner this story after what happened at Newsweek — the swap-out did garner a bit of attention, including a touch of ridicule by Jon Stewart, and the parallels are pretty instantly noticeable (i.e. swapping out an evergreen cover for the very same story about Afghanistan's jihadist tendencies). It's not that teaching the Bible in school isn't importantzzzzzzzzz.... (just kidding, we love tussling over Bible issues but seriously, taking Exodus 21:24 literally? Never mind the Bible, the Talmud in Ketuvot 32b and Bava Kamma 83b should be required reading! C'mon, Time, let's see your cover essay about that). 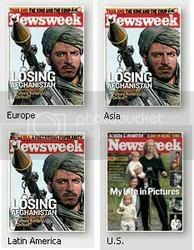 It's just interesting that both venerable newsweeklies chose safer, more homegrown-Americana type covers over deeply reported pieces from the Middle East that advance our understanding of what is happening over there and to what the U.S. may soon have to respond. Plays well in the rest of the world, sure — but I guess not so much in Biblestan. CBNY attacks the source instead of debating the content. Your act is getting so old. This is more evidence of how centrist the MSM really is in this country. World perspective and reality have to dumbed down and avoided to keep conservative egos afloat. There it is Tan. Incredible sh1t. any of you rocket scientists ever consider based on their past blatant lies places like Newsweak can't continue to pull the same sh!t on America?? Again another media outlet (NYT) that admits it lied. When will FOX do the same?